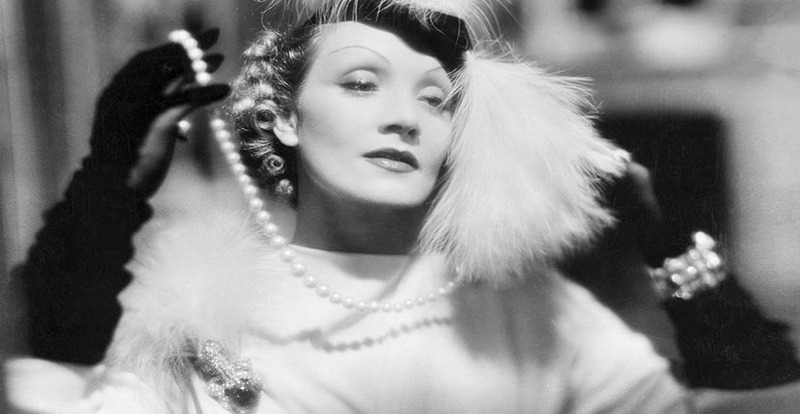 There is a big exhibition at the National Gallery in Washington, D.C. right now, “Marlene Dietrich: Dressed for the Image.” It shows, as the title clearly states, how the star used clothing so effectively to add impact to her stylized photos. Well, I am here to report, she jeweled for her images too. You can see by the way she posed and accessorized, Dietrich knew the jewelry was an important punctuation point to her look. Even if it was just a little sparkle, many of her most famous photos feature jewels. In an iconic 1952 Milton Greene shot from the Smithsonian show focusing on the star’s legs, she held her head down but there is the twinkle of Cartier diamonds on her pinky finger. 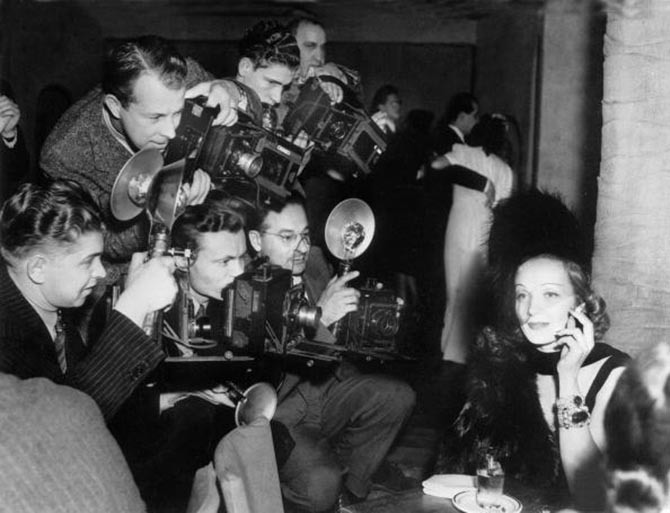 While I haven’t had the opportunity to see the exhibition yet, I have looked at a lot of photographs of Dietrich over the years in the course of my jewelry history research. She was supremely strategic in the way she wore her tightly edited collection of treasures. Her largest statement jewels can be seen in photographs repeatedly over the decades. I wrote about her mega Van Cleef & Arpels ruby and diamond bracelet, the one she wore in Alfred Hitchcock’s 1950 thriller State Fright, here. 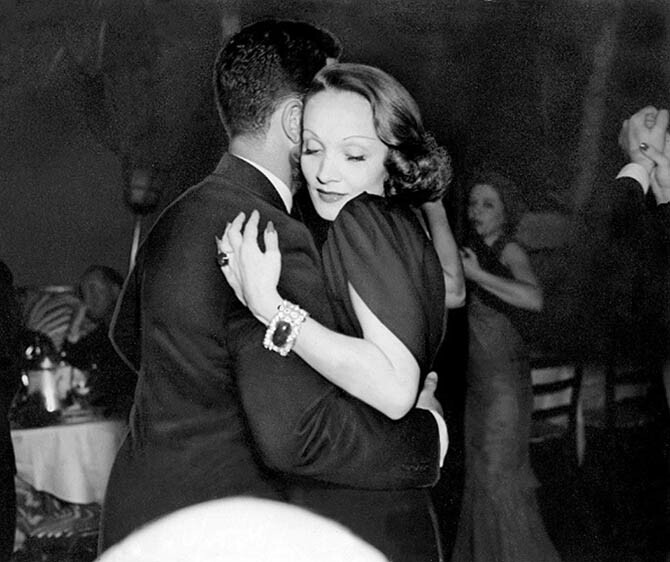 In short, the bracelet was assembled from a couple of Dietrich’s old pieces by Van Cleef & Arpels’ scion, Louis Arpels, who may or may not been one of her lovers. It is not known who gave Dietrich her huge emerald jewels. The bisexual star had affairs with, oh, well, just about everyone. There were her leading men, leading ladies and lots of men with money to burn. I am not going to even hazard a guess as to who gave her the emerald pieces. What I do know is they came from two of Hollywood’s most popular jewelers during the silver screen era. 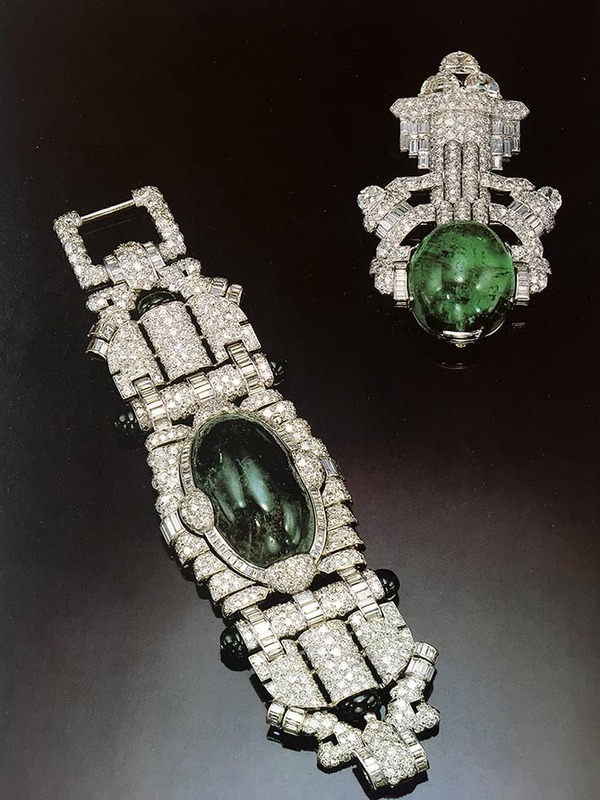 Trabert & Hoeffer-Mauboussin, a firm famous for their over-the-top deco style, made the 128-carat emerald and diamond bracelet and 97-carat cabochon emerald and diamond brooch. The star’s second emerald and diamond bracelet was made by Paul Flato who had all kinds of glorious and witty jewels in his collection but for this piece he was basically doing a Trabert & Hoeffer lookalike. The round cabochon in the Flato jewel, said to be the size of a “bantam’s egg” in the press from the period, could be snapped into a ring. A 1932 photo session with Edward Steichen shows Dietrich in the Trabert & Hoeffer Mauboussin bracelet. She wore the large clip on a dramatic plumed hat when she sat for lensman George Hurrell. And she posed in both bracelets for a sitting with Clarence Sinclair Bull. 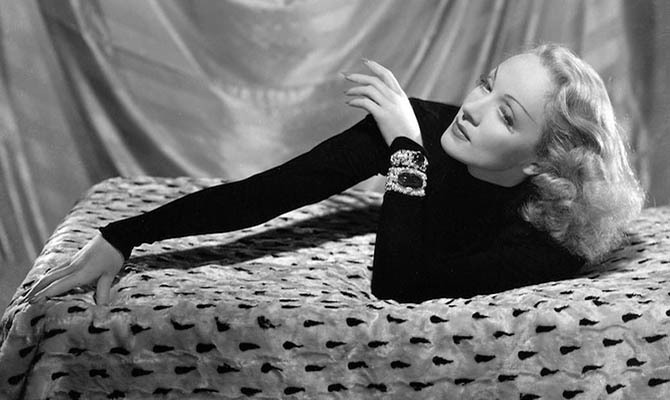 Marlene Dietrich wearing her Trabert & Hoeffer-Mauboussin bracelet set with a 127-carat cabochon emerald and Paul Flato diamond bracelet set with an emerald cabochon in a film still by Clarence Sinclair Bull. 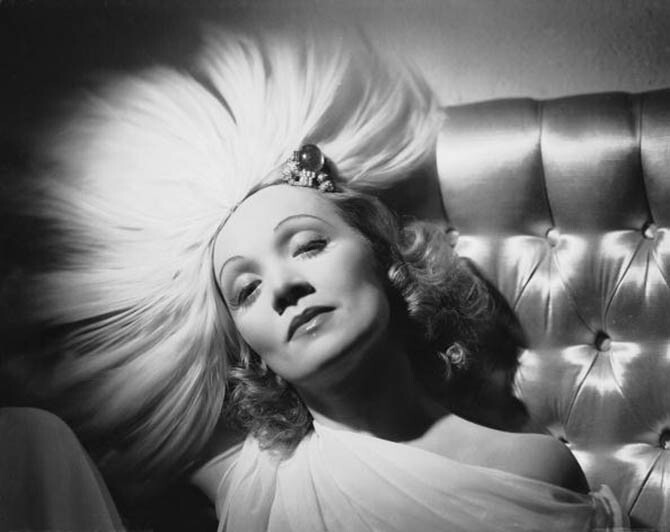 Dietrich flaunted all the emeralds in her films The Devil Is A Woman (1935), Desire (1936) and Angel (1937). In Desire, far and away the best of the bunch, Dietrich played a perfectly attired jewel thief. She tricks an eminent jeweler and a psychiatrist and makes off with a 2.2 million franc pearl necklace. Her getaway becomes a comedy of errors as she is forced to team up with an automobile engineer from Detroit, played Gary Cooper. There was little differentiation between Dietrich’s onscreen style, photo shoots and the way she looked when she went out on the town. Dietrich did not do off-duty—ever. She piled on all the jewels with an enviable nonchalance. I am not sure if there is any more powerful image of her glamour, than to see photos of the star in a couple hundred carats worth of emeralds and diamonds breezily enjoying an evening out. “Marlene Dietrich: Dressed for the Image” will be at the National Portrait Gallery in Washington, D.C. until April 15, 2018.
Who Gave Elizabeth Taylor Her Bulgari Serpenti Bracelet?